1 Peter 4:10 (NIV) Each of you should use whatever gift you have received to serve others, as faithful stewards of God’s grace in its various forms. When my children were little they’d run into the house, their knees scuffed, their cheeks smudged with dirt, and their hands stuffed full of dandelions. A gift for me. They’d smile when I’d pull a vase from the cupboard and treat those weeds with the same care as I would a bouquet of long-stemmed red roses. One day, one of the neighbor girls came in with my daughter and handed me a fistful of flowers. After hugging my daughter and adding yet another vase full of yellow blooms to my collection, I tried to encourage the neighbor child to take her bouquet home to her mommy. She pouted, shook her head, then proceeded to stuff her fist toward me again. “My mommy just throws them in the trash.” Stunned and not knowing what else to do, I took the flowers from her and gave them the same special treatment I’d given the bouquets from my daughter. It made me wonder how many times, like her mother, we have refused the gifts God has given us. How many times have we missed the blessing God wants to bestow on us? When we’re asked to be a substitute for a Sunday school class, do we turn away? Do we shrink back from an evangelistic effort because we’re afraid? Do we refuse to sing in the choir because we question our ability? How often have we thought of someone, even felt led to call them, encourage them, and perhaps utter some of God’s truth in their ear? But we never do. Aren’t we missing the blessing–the gift that comes back to each one of us when we do God’s will? Do we miss out on what God has in store for us by doubting our faith? Do we ever wonder if God is in control? Do we doubt His ability to meet our needs? Do we question His ability to perform miracles (through us and for us)? Faith is a gift. How many times, like my neighbor, have we thrown God’s gifts into the trash and never looked back? Because of our disregard for the gifts He wants to give us, we’ve never witnessed the joy on God’s face—the same joy I saw on that little girl’s face when I took her flowers and set them in a place of honor at my kitchen table. 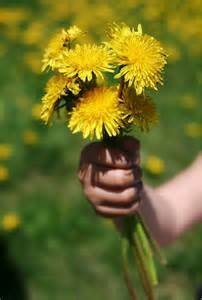 From that day forward, until the little girl’s family moved away, she brought me dandelions. If God sees He can trust us with one gift, He will provide another, and another. He will multiply our blessings because of our faithfulness and willingness to step out in faith. Sometimes this means having to face our fears, but remember, if God has ordained it, He will help you achieve it. This entry was posted in Devotion and tagged Devotion, gifts, God's Gifts, serving by Jennie K Atkins. Bookmark the permalink. Thank you for this post. What a powerful reminder to us all. I am reading this on Sunday morning right before I head off to lead my worship team in practice. You have put me in a great mindset to go and use my gifts to lead others to worship our King. Jennie, what a sweet reminder. I can’t tell you how many times I’ve placed weeds in a vase that I received from the kiddos in my life. And it’s amazing how long those weeds will live if keep tending to them. Another good lesson in life, huh?